Let me start with eliminating a possible misunderstanding. The music of the new Dutch band Illumion cannot be compared to the likes of Delain, Within Temptation, After Forever, Epica etcetera. A more suitable comparison can be found in bands such as Magenta and The Gathering. But where these bands end, Illumion continues. The use of authentic traditional Chinese instruments sometimes gives the music an Asian shine. Furthermore, classical and jazzy influences are not avoided. Therefore, this band is diffcult to place. Illumion is founded in 2002 by Eveline van Kampen. That year she graduated from the conservatory. Also other bandmembers have a (higher)education in music. This displays itself on their debut album. I dare say, we are dealing here with very strong composed and well-conceived music. In order to fully appreciate this album, it needs multiple spins. Esther Ladiges' vocals (entropy, Ixion) are responsible for this. It is a voice you do not encounter in 'prog' very often. Her voice is obviously trained and often has a jazzy tone. In addition, the song structures are quite unusual too. This is the reason why I can enjoy this album over and over again, but at the same time I do understand why other people might cop-out right away. The hour this album spans is divided over 11 songs averaging just over 5 minutes each and are all of comparable quality. The lyrics portray historical and literary themes and thede themes are mentioned in the booklet next to the lyrics. Scarlet sin shows a wide variety of technical fireworks of Esther Ladiges. After a few spins, the layered backdrop of subtle keyboard parts and heavy guitar playing unfold to you. Classical influences are audible in Chrysanthemum, and especially in the vocal parts. Guest player Marjolijn Kaiser plays the pipa, a four-stringed Chinese lute, which gives the song an Asian character. Eveline's guitar playing is strong. With her varied play, she manages to impress defining accents on the music, as is obvious in Into the Labyrinth. Her short, subtle solos never dominate, something a lot of male collegues suffer from. It might be coincidence, but Metamorphosis shares striking similarities with the Magenta album with the same title. The heavy guitar foundation is alternated with beautiful keyboard playing of Annemieke de Boer (replacement of keyboardist Eveline Simons). Van Kampens biting guitar solos provide beautiful contrasting colours. The prophecy marks the beginning of heavier part of the album with a number of guitar orientated songs. Heavy and spacial guitarriffs and airy keyboard sounds in the background. The predominant guitar parts are merely interrupted by Peter Boer's short keyboard solo. In the following song Died For Beauty the guitar even inclines to Rush. The versatility of Illumion displays itself on Infinity. Partly due to Irma Vos' violin solo, this song has a mysterious aura. This song is the first to prominently feature the bassguitar of Boer. 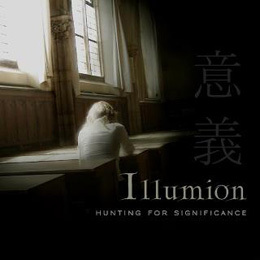 7 years of preparation and designing of Illumion and "Hunting For Significance" has played outside prog scene's field of vision. Let us hope that the coming 7 years presents us with more of these albums. Also due to the beautiful and polished artwork, this album has an international shine. A curtsy and applause are in order.